Dirt motorsports enthusiasts know that the worst part of the hobby is cleaning caked-on dirt and mud. Driven Racing Oil™ Speed Shield is the ideal product to make those cleaning headaches a thing of the past. After pressure washing the vehicle, spraying it down with Speed Shield will rinse away the smaller remaining dirt particles and leave a shine that isn’t wet or oily. It does so through the use of advanced surfactant technology to provide a durable, lasting polish that helps prevent mud and dirt from sticking to surfaces. Ideal for off-road, powersports and dirt racing vehicles, this fast-drying, water-resistant product works great on plastic, paint, decals and fiberglass. 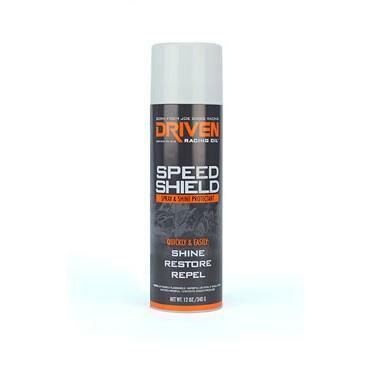 Driven Speed Shield comes in an aerosol can that utilizes a powerful spraying action to displace dirt. With no wiping required, it makes all cleanups easier.